A visit to the Aviva Centre for the Rogers Cup tennis tournament is a summer highlight for most Toronto tennis players and for the campers enrolled in the Philpott Children’s Inner-City Tennis program, it is a life time experience. 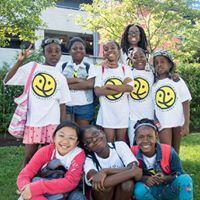 On Tuesday August 8th, on a beautiful sunny day, one hundred children from three Philpott sites, arrived at the Aviva Centre at York University for a fun filled day. While the Doug Philpott Inner-City Children’s Tennis Fund holds free tennis lessons at 19 sites, the children were chosen from 3 different sites this year San Romanoway Revitalization Association, Antibes and Jimmie Simpson Community Centres. The children were accompanied by instructors from each site, the three Philpott supervisors, our volunteer coordinator, several youth and parent volunteers and two Philpott Board members. 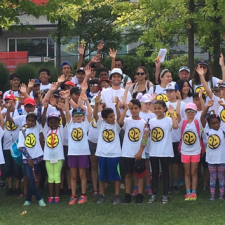 Prior to arrival at the Rogers Cup, the children were given Philpott happy face tee shirts which they wore throughout the day. After a brief walk about the grounds, tasting the free samples and playing some of the tennis challenges, the children headed off to the centre court stands to watch our very own Canadian player Eugenia Bouchard play against Donna Vekic. Unfortunately Bouchard lost to Vekic, a player from Croatia. Some of the older Philpott campers were treated to a behind the scenes tour of the Aviva Centre courtesy of Tennis Canada representative Alan Ma. At noon Tennis Canada provided a VIP seating area and a delicious lunch for the children. After lunch the afternoon activities were optional. Some children returned to watch the Bouchard versus Vekic match, while others roamed the grounds playing games. The children really enjoyed showing off their tennis skills on the mini tennis courts and travelling away to holiday destinations with the virtual reality googles. On a side court, they watched the skills of the wheelchair tennis athletes. Then it was off to the buses, stopping briefly for a group photo at the #RogersCup sign and an ice cold bottle of water. Due to the generosity of Tennis Canada, the Philpott charity and the perfect weather, the Philpott campers had a wonderful day. On behalf of Tennis Canada, Holly Werda was a wonderful host and Alan Ma was a very good tour guide. Many thanks to Kim Lowes the photographer who chronicled the day. (See the photos on the Philpott website at www.philpottchildrenstennis.ca.) Huge gratitude to our Philpott supervisors Chris, Ricky and Alan, our Volunteer Coordinator Matthew, our Philpott instructors and volunteers and our Philpott Board members Sharon and Eleanor who joined us for the day. 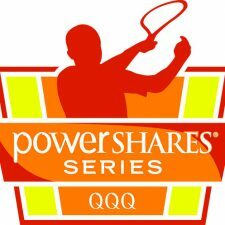 Thank you Tennis Canada. For everyone involved and most especially for the Philpott children, it was a perfect day!